I’ve walked along Wellington’s waterfront past Frank Kitts Park dozens of times, and often stopped to read the plaques commemorating various naval events; shipwrecks, landings, etc. Yet today was the first time I’d ever seen this memorial to the New Zealanders who took part in the Arctic Convoys of World War II. These delivered vital supplies to the USSR during a time when the Nazis controlled much of the territory around that vast country. 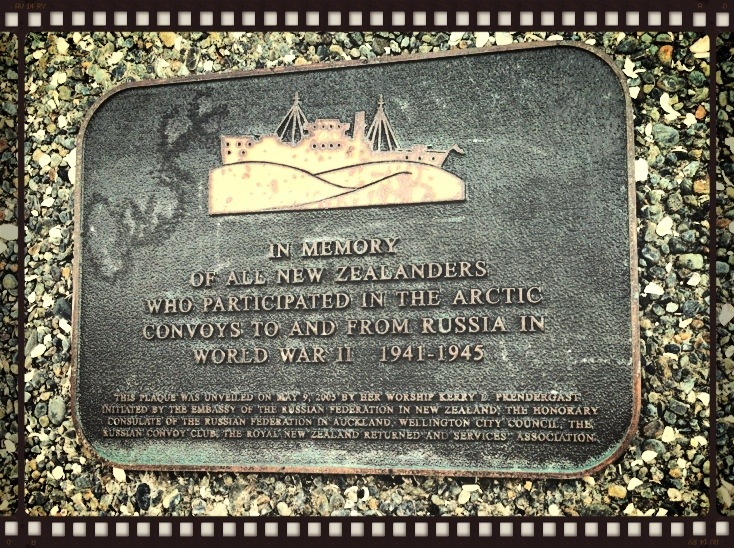 I was really touched by the memorial because my great uncle, Stewart Cruden, also sailed on the Arctic Convoys, losing his life in 1942 when his ship, a converted whaler called the Shera, capsized in atrocious, icy conditions in the Barents Sea with the loss of nineteen lives. My great uncle’s death is commemorated on a memorial to members of the Royal Naval Reserve in Lowestoft, England. From that memorial I know that the sailors who died on the Shera were Scottish, English and Norwegian. There were no New Zealanders; but obviously, amongst the many hundreds of boats in the convoys, Kiwis did serve. I’m glad they have been remembered. Ok, so the second mystery. It’s not as juicy as the significance of the mysterious John Boyd – but I’m curious all the same. Susan’s three Trustees were John Boyd, William Nicholson (her youngest child – and given that he was born 23 years after her first child, probably something of an after-thought), and David Forbes Nicholson, Susan and Andrew’s eldest surviving son. What I’ve learned about David so far is that he was their third or fourth child, and the first to survive more than a few weeks. He was born in 1865 while the family was living in Glasgow. The 1881 census shows 16 year old David as an apprentice bank clerk. He then disappears from the Scottish records until the 1901 census. There is neither a mention of him in the 1891 census, nor a marriage record, although I know he did marry. I suspect he was living in England for at least part of the period (why? I’ll tell you in a minute). By the 1901 census David has reappeared and is living at Rosslyn Villa, Windmill Road, Kirkcaldy with his wife, Minnie and a servant named Elizabeth Penman (who I’m sure is related to David’s brother-in-law and my great grandfather, Thomas Elder). Minnie’s place of birth in the census is given as Guernsey, Channel Islands. That makes her the first member of my ancestral family that I’ve found who was born outside of Scotland . David’s occupation is given as Inspector of Poor, Collector of Rates and Clerk to the School Board – probably not the most popular man in Kirkcaldy! In the 1911 census, he and Minnie are still living at Rosslyn Villa, but now have a servant called Helen Marshall. Minnie’s sister Louisa Warry is also living at the address. David’s occupation is now given as Inspector of Poor, Parish Council. The reasons I suspect that for at least some of the years between the 1881 census and the 1901 census, David Nicholson lived in England are first of all that Minnie is English. According to Susan’s Will, Minnie is actually called Mary Ann Clementine Warry. In those days I don’t imagine single women had the same freedom to travel, so I’m guessing they met closer to Minnie’s home than David’s. Also, a search of the English census records for 1891 in FindMyPast gave me an entry for a David Nicholson, aged 26 (tick), working as a bank clerk (tick) and living as a lodger at 42 Rectory Road, Hackney. The problem is that his place of birth is listed as Kirkcaldy, Scotland and I know that while the family is from Kirkcaldy, David was born in Glasgow. 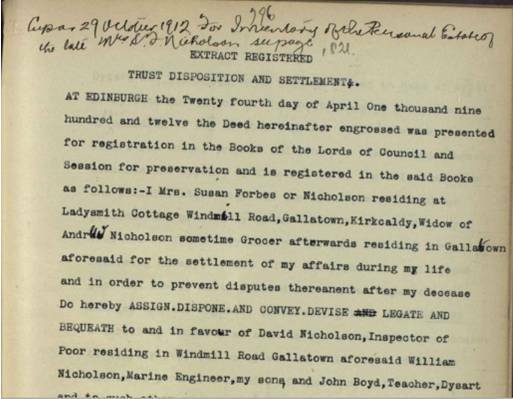 However, the other person listed as living at the same address is also a bank clerk from Kirkcaldy, so it is possible that there was a mix-up in either listing or transcribing the birthplace. I did this search in a rush at the library, so will have to go back and investigate further. Anyway, I’m curious about David and Minnie. I don’t know when or where they were married, and whether they had any children. There are no children living with them in either the 1901 or 1911 census, but it’s possible they did have one or more kids who did not survive. One of the reasons I’m interested is that in Susan’s Will she left three portraits in oils to David. These were of Susan Forbes, Andrew Nicholson and Andrew’s father Alexander Nicholson. Since I have no photos of any of these people, I’m utterly fascinated by the idea that there were portraits in existence. 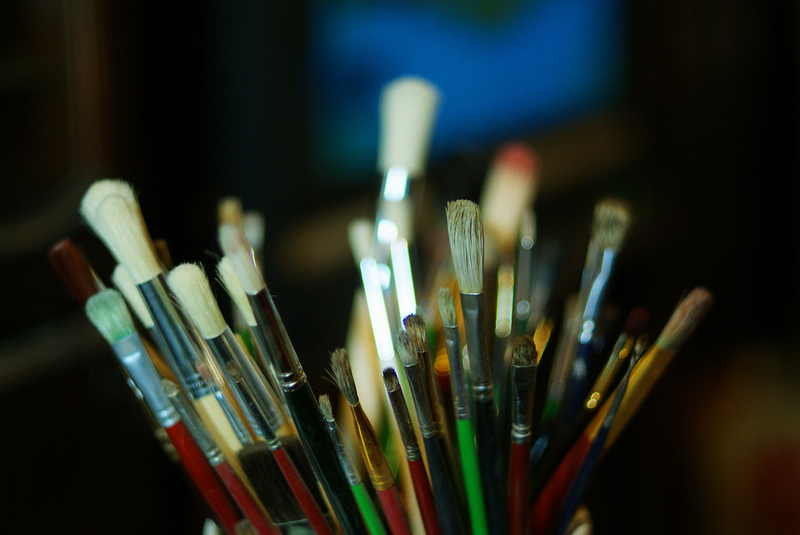 Since it seems that neither David or William had surviving children, I wonder what happened to the paintings. My guess is that they’ve been destroyed, and this makes me incredibly sad. David Nicholson died on 16 January 1946, at a nursing home in Burntisland, Fife. he suffered a cerebral hemorrhage and cardiac failure. His brother William is given as the informant of his death, and his usual address was given as Ladysmith Cottage, Windmill Road. This was the house his mother retired to and the house that William lived in, and inherited from Susan. Minnie had died in 1934, and it seems the two – apparently childless – brothers shared their mother’s house after that time. William died in 1964, at the age of 81. When I mentioned to my dad that I’d been looking into this part of the family (his maternal grandmother’s line), he remembered both his great uncles Bill and David. He’s never mentioned the two great aunts, Elizabeth and Mary – so I guess I’ll have to check them out next. … there’s a mystery (or two). Apologies for the terrible pun, but I’ve just been looking through my 2 x great grandmother’s Will. Susan Forbes died in 1912, leaving what seems like (certainly for my family) a reasonably tidy estate. 1912 being well before the advent of “plain English” Wills, I’ve struggled a wee bit to unpick all the jargon and get to the juicy bits – who got what! In fact, I’ve actually been a bit sidetracked by a couple of mysteries. Susan Forbes named three Trustees in her will; her sons David and William Nicholson – and also John Boyd, Teacher, Dysart. I initially assumed that John Boyd was a son-in-law since, as well as her two sons, Susan had three daughters (Mary, Elizabeth and Annie) who survived to adulthood. All three are named in her Will along with their husbands. Mary married a George Brown, a Joiner; Elizabeth married a David Oliphant, a Grocer, and my great grandmother, Annie married Thomas Elder, an Ironmonger. So no John Boyd there. The 1911 census shows a John Boyd aged 64, School Master, living at 33 Normand Road, Dysart along with his wife of 34 years – Jessie – and three adult daughters. John’s place of birth was Perthshire, and although I’ve found branches of my family in that region, the Forbes-Nicholson lot seem to have been in Fife (in fact in and around Kirkcaldy) for generations, so there’s no obvious Perth connection. Jessie Boyd, however, was shown as having been born in Dysart. My next thought was that Jessie Boyd may have been a sister of either Susan Forbes, or her husband, Andrew Nicholson. That didn’t seem to be the case, so I used some of my dwindling supply of Scotland’s People credits to try and find the marriage of John and Jessie. The only one I found that fitted the time-frame (I assumed they married in Fife on the basis that it seemed more likely he or his family had travelled from Perthshire to Fife (like so many others looking for work) than that she had travelled to Perthshire, married then come back to Fife). … my great grandmother Annie Nicholson (daughter of Susan Forbes of the cryptic Will), had an illegitimate son in 1894, named Andrew Scott Nicholson. His father is not named on his birth certificate and I had wondered where the Scott came from. At the time Annie was a Public School Teacher – the same as John Boyd. Is it too far-fetched that my 2 x great grandmother named as a Trustee in her Will the married-to-someone-else father of her illegitimate grandson? Susan Forbes seems to have raised her grandson – despite his mother living around the corner with her husband and legitimate children. She also left Andrew £100 in her Will. Actually, she left it in Trust – earning interest until Andrew reached majority (not sure what age that would be – 18 maybe?). The more I learn about Susan, the more I realise she was a very canny woman. So there’s my first mystery? Who was John Boyd and why did Susan Forbes make him a Trustee? I know that the Fife County Archive has Minute Books for schools in Dysart that cover the period my great grandmother was a teacher there. If I ever get my UK trip organised, I’ll have a look and try to find out if John Boyd was a colleague. Meantime, I’ll try to think of other connections that I might be able to verify. Any suggestions about this very welcome! where does time go when I’m blogging? Actually that’s not it, but I’ve just seen the clock, and I’ll have to make the second mystery another post. A recent photo of the former Kirkcaldy Combination Poorhouse. Photo credit: Kirkcaldy from the south-east, 2001. © Peter Higginbotham. A few months ago I discovered that my 2nd great grandfather, Rankine Gourlay, was a patient at the Fife and Kinross Lunatic Asylum at the time of the 1891 census. With a wee bit of digging, I discovered that the asylum records had been kept – and were held in the archive at Fife Council. I emailed the very helpful archivist there, and dispatched my mother to have a look at the patient records for my great, great grandfather. What we found was that Rankine had been admitted to the asylum in July 1889 with syphilis. He had been a merchant seaman, but lost his job because of the infection. According to his patient records, he was delusional and while in the asylum had a stroke and also attempted suicide. Despite this, he was discharged from the asylum in October 1891. I don’t know what happened to him after that, but I do know that he was a resident at the Kirkcaldy Combination Poorhouse at the time of the 1901 census, and died there in July 1903 -aged 58. It seems that few records remain of the poorhouse, and none relating to the period of my ancestor’s stay there, so it’s likely I’ll never find out what actually happened to him in the last 12 years of his life. I had all but forgotten about Rankine until a couple of days ago when I listened to a podcast of the BBC Radio Scotland’s Digging up your Roots. This is a great radio programme specifically about family history research in Scotland. For those who don’t know it, each episode deals with a separate issue – records related to seafarers or excisemen for example – and one of the most recent was about asylums. I learned quite a lot about the role of these institutions in Scotland in the nineteenth century – including how prevalent it was for patients to be admitted because they suffered from syphilis. I’m no closer to knowing more about my own ancestor, but at least after listening to the podcast I feel that I understand the context of his life a bit better. My father-in-law during his RNZAF days. In some ways the choice of this photo of my father in law, Roger Gray, for this week’s Daily Post photo challenge “Up” seems a bit obvious – maybe even cliched. But it is especially poignant this week. Roger was a pilot in the Royal New Zealand Air Force for several years before joining NAC; New Zealand’s domestic airline. He flew for NAC, and later Air New Zealand for over twenty five years – retiring in 1986 as the senior captain on domestic/Pacific flights. Even now, when we board Air New Zealand flights they are sometimes piloted by people Roger helped to train. I’ve been thinking a lot about this photo in the last few days; of the confident, smiling young man fulfilling the dream of so many boys (and girls). Last Tuesday, Roger fell and broke his hip. He is now in hospital, in pain and waiting for an operation. He has family around him and is receiving skilled and compassionate care. But his recovery will be painful – and probably slow. For Roger, “Up” has a whole new meaning. My parents’ wedding: left to right my paternal grandfather David Leslie; my maternal grandmother, Margaret Ramsay (nee Cruden); my dad’s brother David Leslie; my dad Ron Leslie; my mum Elizabeth Ramsay; my mum’s sister, Sandra Ramsay. I’ve chosen this photo for the Daily Post Weekly Photo Challenge because it’s the only photo I have of my parents at their wedding; a day that changed their lives forever. My mum and dad are of a generation that did not live together before – or instead of – marriage. They met, got engaged, saved for a wedding and for the things they’d need for a home together while both were living at home with their parents. Hours after this photo was taken, they spent their first night together. I think my mum said they had their honeymoon in Stirling, but I realise I don’t actually know. For me, growing up in a much more permissive generation, this bit of information has never been important. My parents were married for 27 years. They raised three kids and grieved for a fourth who was stillborn. They emigrated from Scotland to New Zealand and spent most of their married life away from the support – and perhaps interference – of their families. Mum and Dad divorced in 1984, and my dad’s been married to his second wife for almost as long as he was to my mum. When I was growing up, I can remember a white album of photos of my parents’ wedding; each page separated by crisp film-like paper. I don’t remember all the photos, but I know there was definitely one of my mum with her father and another of my parents cutting their wedding cake. The album has gone; my mum said she took the photos out and threw the book away during one of her house moves. While I am grateful to have this photo; it also makes me sad. My parents – who are the “star attraction” of the day – are farthest away from the camera. My dad looks happy in a slightly punch-drunk kind of way, but my mother’s expression is unreadable. 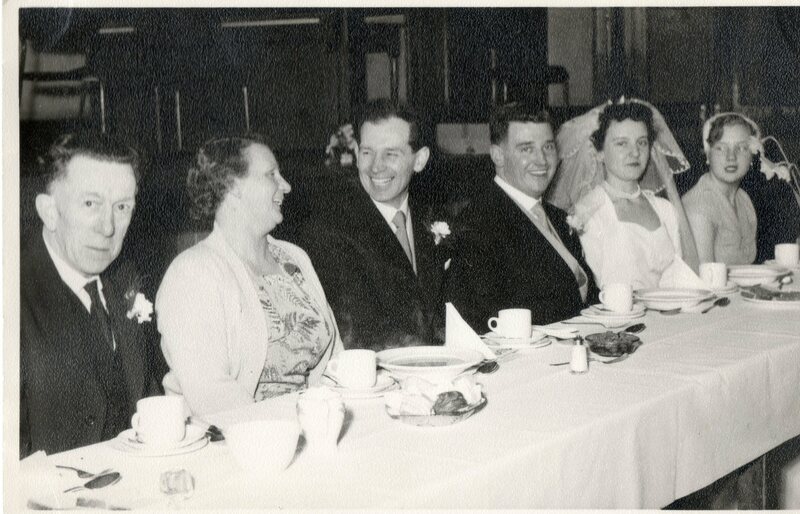 My grandfather, David Leslie, in the immediate foreground seems to share my mum’s expression, and in fact the only people who look like they are having fun are my mum’s mother, Margaret Ramsay (nee Cruden) and my dad’s brother (also called David Leslie). My aunt Sandra, at the far end of the table looks like she’s realised she’s missing out on something. My parents’ wedding: left to right, my maternal grandfather, David Ramsay; my great aunt, Elizabeth Ford (nee Elder) and my great grandparents, Katherine and Alexander Cruden. 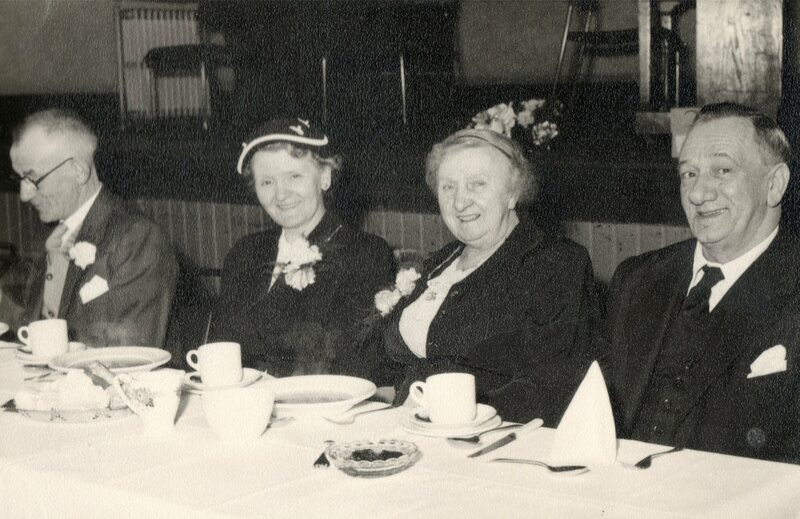 My grandad Ramsay, on the left, looks happy – although you can’t really see his face. He had five daughters and my mum was the fourth he’d walked down the aisle. Next to him is my great aunt Bessie. She was my paternal grandmother’s younger sister, and, being a widow, seemed to accompany my similarly widowed grandfather David Leslie to family events. Closest to the camera, and looking like they were enjoying themselves are my great grandparents – my mum’s mother’s parents. Alexander and Katherine (nee Black) – whom I’ve written about before – were married for sixty two years, until my great grandad’s death. Knowing that my ancestors all seemed to have large families, and also tended to stay in the same area all their lives, I can’t imagine how many weddings my great grandparents had been to by the time Mum got married. Perhaps, more than anyone else, they’d got the hang of it! With thanks to Lisa Alzo, author of The Accidental Genealogist blog for her wonderful idea to “celebrate and honor ‘fearless females’ in our family trees”. This post is inspired by her ‘Names and Naming Patterns’ suggestion. As a very small child I used to get confused by my family. Both my granddads were called David, I had three uncles called David, a couple of Uncle Sandy’s and more than a few Uncles Bill. I also had an Aunt Sandra, a cousin Sandra, two cousins called Robert and two called Elaine. Partly these came about through marriage, but mainly it’s because my family seemed to adhere to a very Scottish pattern of naming children. I won’t try to explain it here since Judy Strachan at Judy’s Family History has done such a good job of it already. In fact, it’s since I read Judy’s post on the subject that I’ve been able to add a few more people to my tree. These have tended to be children who were born and died between censuses. I’ve found them because I knew they probably “had to” exist – based on the names I had for family members who did appear in the records. As I’ve mentioned in previous posts, I’m named after my paternal grandmother, Susan Elder. What I only discovered recently (see above) was that she was named after her (maternal) grandmother, Susan Forbes. Actually, in writing this, I realise that my parents weren’t really adhering to the pattern, or I would have been called have been Margaret; and that would have made three – no four living related Margaret’s for me to be confused about.